Publication details: Book. 1999. viii and 166 pages. Publication date: 1999-07-16. 87 figures and 5 tables. Paperbound. Middle ear cleft cholesteatoma is a frequent pathological condition which, for more than a century, has stimulated an impressive amount of research, work and debate. At the dawn of the third millennium, it is our hope to present a critical and contemporary evaluation of the situation and to provide information which will lead to further advancement in this field. Therefore, we focused solely on the mechanisms of the genesis of this disease, and combined the wisdom and experience of experts with a review of the literature on the state of the art regarding the pathogenesis of cholesteatoma. We are indebted to those authors who accepted our challenge and made a positive, realistic contribution to this topic. They have attempted to instill into us the current and foremost thoughts on this intriguing entity. This book has been set up as an informative work of analysis and reference, intended for use in the future in both fundamental and applied research or, in other words, as an educational tool. It will also be of great value to all those interested in the medical and surgical aspects of cholesteatoma, especially residents in training and practitioners in the art and science of otology, as a basic instrument to assist in the more accurate and uniform management of this disease. 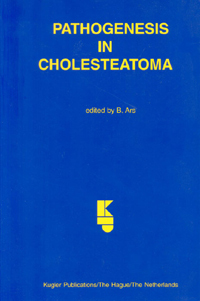 The latest of several basic science publications from the University of Antwerp, this examines the anatomical " cellular, genetic and biochemical factors which contribute to the development of (mostly acquired) cholesteatoma. This multi-author work can be very repetitive, suggesting a somewhat vague brief to authors. Perhaps this is why the title (surely it should be "of"?) is reflected in the titles of four of the nine chapters: Pathogenesis of acquired cholesteatoma; Pathogenesis of cholesteatoma (twice) and even Cholesteatoma and Pathogenesis. Nonetheless, for anyone interested in the basic science of cholesteatoma this small paperback is a godsend. A chapter on the "Enigmatic biology of human cholesteatoma" makes heavy reading and, in retrospect, it is better to start with the summary at the end! It is a masterfull, updated and superbly researched and referenced account of this subject which will be invaluable to sad people (such as this reviewer) who seem to be interested in the molecular biology of cholesteatoma. There is an unconvincing and sometimes irrelevant closing chapter on fibreoptic examination of the nasopharynx and two chapters on supratubal recess which are unnecessarily duplicated, the last being more a short paper. Overall, this is a well illustrated work which might usefully have avoided repeated description of retraction pockets, migration, metaplasia etc. with which most otologists are familiar. Its strength is a marvellous bibliography and some "star" chapters for the enthusiast. No ORS meeting is complete without papers on sway magnetometry, mucin genes and MMP assays in cholesteatoma. If the last means anything to you, you'll like this book. I did. This handy and pleasant book of 164 pages is composed of 9 manuscripts, each dealing with the theme "Pathogenesis in Cholesteatoma". The articles are written either by clinicians, pathologists, biochemists or by biologists. Based on their own experience and research, each author presents a different and original approach to the etiology and pathogenesis of cholesteatoma. However the pathogenesis of this disease remains a vast field for research and discussion. As a matter of fact, one has to review the extensive reference lists at the end of each article. This book is a real reference and informative tool for the clinician as well as for the researcher, all involved in this exciting aspect of the ear pathology. Middle ear cleft cholesteatoma is a frequent pathological condition which, for more than a century, has stimulated an impressive amount of research, work and debate. At the dawn of the third millennium, it is our hope to present a critical and contemporary evaluation of the situation and to provide information which will lead to further advancement in this field. Therefore, we focused solely on the mechanisms of the genesis of this disease, and combined the wisdom and experience of experts with a review of the literature on the state of the art regarding the pathogenesis of cholesteatoma. We are indebted to those authors who accepted our challenge and made a positive, realistic contribution to this topic. They have attempted to instill into us the current and foremost thoughts on this intriguing entity. This book has been set up as an informative work of analysis and reference, intended for use in the future in both fundamental and applied research or, in other words, as an educational tool. It will also be of great value to all those interested in the medical and surgical aspects of cholesteatoma, especially residents in training and practitioners in the art and science of otology, as a basic instrument to assist in the more accurate and uniform management of this disease. A cholesteatoma is an important clinical consideration in patients with chronic ear diseases or recurrent ear infections. The actual causes of a cholesteatoma are still poorly understood and much research has been devoted to developing concepts of how squamous epithelium in the temporal bone can become erosive and destructive. Bernard Ars of the University of Antwerp (Belgium) has edited a multi-authored, extensively referenced paperbound text entitled "Pathogenesis in Cholesteatoma." For the most part this text is well done and clearly written. However, certain concepts may be considered controversial, such as the role of the mastoid air cell system and gas pressure balance in the middle ear cleft or the utility of routine nasopharyngeal endoscopy in patients with cholesteatomas. There is also little discussion of the role of surgery and its consequences in patients with cholesteatomas. "Pathogenesis in Cholesteatoma" will find its best use in a reference library or in teaching basic science to residents in training. Unfortunately, it will have limited use by busy clinicians in practice.